Samedi 15 septembre. 15h – 23h. free. 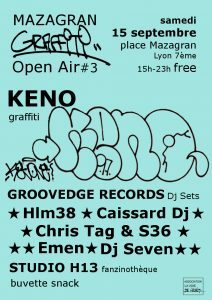 Avec Keno, Groovedge Records, Emen, Dj Seven ..
Samedi 16 juin 2018. 11H-22H. free. 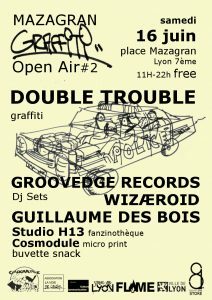 Avec Double Trouble, Groovedge Records, Guillaume des Bois, Wizæroid, Dj Seven, Emen, Pizza LAB, Club Maté, and Guests. Samedi 5 mai 2018. 11H-22h. free. 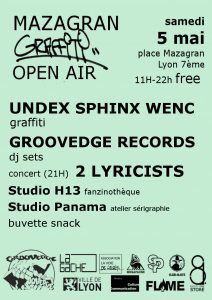 Avec Undex, Sphinx, Wenc, Groovedge Records, 2lyricists, Studio H13, Studio Panama, 81Store, On a tueR Maité, Pizza LAB, Club Maté, and Guests. Adresse: Place Mazagran, 69007 Lyon.